% of all employees. What ever, as stake owners in the blockchain we do not need them to make us move forward. So this is the reason for this short post on steem-engine and the damn amazing team.. yes the same team that created @steemmonsters. You would already guess how this is going to end up! So coins I bought and Coins I mined.. yes I guess gambling is now called investing or mining coin. Funny how and what Crypto brings out. Welcome to the new world I guess. I reached out to @jayplayco because his name is on the Description of the Token, and he is a person I meet as a Mod for @steemhunt in the early days. JJM is a token based on steem-engine.com using a side chain of Steem. With a holding Steem Power of 500K SP owned and bought from @virus707, this SP is used in combination with JJM tokens to upvote, reward and distribute dividends out of the JJM project to JJM token holders. Our final goal is to create high-quality content and external revenue from advertisement to bring the Steem blockchain to the next step and help the Dapps within the Steem environment. But @jayplaco laid it out even better for me with a bit more juice. short-term fact for the moment. If you hold more than 100JJM (estimated price currently about 16Steem) you will get a daily upvote for 2% from virus707 which is about 0.26$ STU per day => about 0.5Steem. 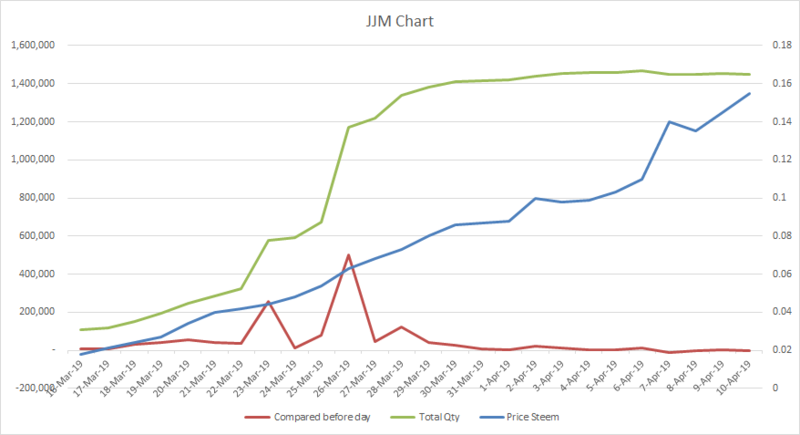 You would get an ROI of 100% within 32 days.Every 1000JJM is giving 1% more for upvoting.This is the current price chart (the blue line) for JJM. As mentioned the main goal is to create high quality content to get external revenue (advertisement and sponsors) on board to be able to distribute that additionally to the JJM holders. JJM more details and info on project. there is an additional distribution of dividends. If you have a look at the account of @jjm13 the whole liquid Steem is going to be used for dividens. In the moment if you hold more than about 2500 JJM you would be able to get more than 1 Steem in dividends.Theses dividends are coming from different revenue sources that virus707 creates from investments and curation, etc.The tokens are mainly bought, the only “airdrop” if you see it as airdrop is currently the tournament money we use as marketing vehicle to create new and good content for Steemmonsters.Small parts as airdrops are sometimes given for small marketing events like resteem events, but that is also currently in the last month within 2000 JJM distributed. So, yes the distribution and sales of JJM are almost mainly driven by the buy-in market.In the current moment the MAX ROI you could get from upvoting is to hold 45K JJM, as the max upvoting is 45+1%.These upvoting rules are going to be changed (as announced), as we would need to adapt the rules when more holders are coming and we get more steempower.An important part is, the Steempower from virus707 is not ninjaminded nor delegated, but in the moment purely bought on the market, which is a strong point. There is no risk that a big delegator could just undelegate their Steempower. This one is short and sweet, @kryptogames has created a dice game and also included “mining” tokens but they have collaborated with the steem-engine team to provide you with trad able tokens!! A first for any gambling site, yes even @magicdice does not have Trade able tokens, they Earn* dividends. At the moment every 1 STEEM bet* earns you 100 Gamer tokens straight to your Wallet (Steem-Engine) which is awesome. So every body and their mother are doing the somewhat safer bet of under 96. I am not going to lie so am I. What faster and safer way to “mine” these tokens. If you have not had a chance to check out steem-engine I think you should. If I where you I would jump on some JJM : ) you might never know.